Welcome back, my DIY friends. Cutting Edge Stencils hopes you enjoyed the beautiful weather this past weekend. The sunny Spring weather has the birds chirping and flower buds popping up. Do you know what else tends to pop up more in the Spring? Yard sales, garage sales, and flea markets! Thrifty furniture finds are waiting to be found. You can uncover the hidden charm of a cast-off piece with just a bit of creative stenciling and some elbow grease. 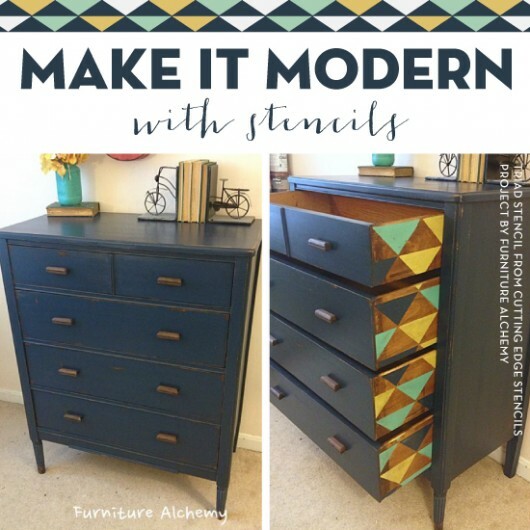 Today we’re going to share two furniture makeover stories featuring our stencils. Meet Bonnie, the self declared craft and furniture nerd behind the blog Revolutionaries. Bonnie stumbled upon a set of mid-century dressers that were shouting for a makeover. The first thing she did was remove the hardware and sand them down. Then she painted them using General Finishes Milk Paint in Driftwood. Once they were painted Bonnie said, “When I saw this stenciled dresser on Pinterest with only the top drawer stenciled, I knew I had to use the same technique on the mid-century cuties!” Bonnie used our Herringbone Craft stencil. She used painters tape to hold it in place while she painted the geometric pattern in Behr’s bright white using a dense foam roller. After each section was painted, Bonnie would lift the stencil and realign to complete the pattern. Once the pattern was painted, she chose to distress the white so that contrast wasn’t so stark between the two colors. She applied a General Finishes High Performance Top Coat to seal and protect the paint. To complete the look, Bonnie added white hardware. She commented, “I love it!” We do too! Meet Sheila, the furniture makeover queen behind Furniture Alchemy. Sheila was super excited when she spotted an old dresser at a flea market for a steal of a price. The first thing she did was paint it a deep navy blue and then give it a slight distressed look. Sheila didn’t stop there with the makeover. Then she chose to paint a geometric pattern on the side panels of the dresser using the Triad Allover Stencil. She used blue painters tape to hold the stencil in place and a dense foam roller to paint the pattern. 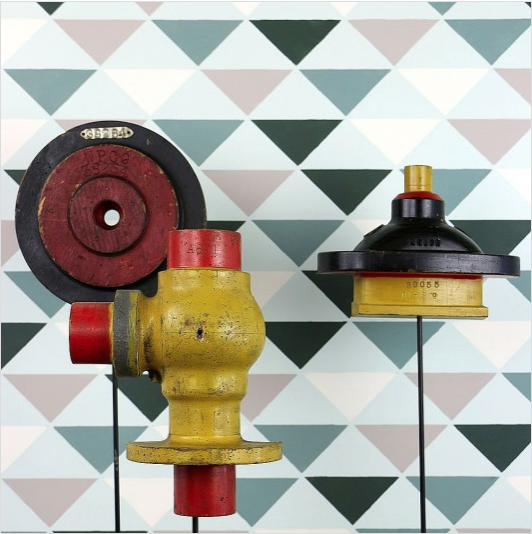 Rather than paint it a single color, Sheila painted the triangle pattern in turquoise, golden yellow, and navy blue for a modern touch. After it was painted, she had this to say about the finished piece, “Business on the outside, party on the inside!” We love a little stenciled surprise, don’t you? Tell us, which one of these stenciled dresser ideas do you like the best? We’d love to read your thoughts so leave us a comment below! Haven’t had enough stenciling fun? Shop our craft and furniture stencils and find the perfect one for your furniture redo project! Join us on Pinterest for home decor inspiration! Have you completed a project recently? Then come share it with us on Facebook! Fill Your Walls With Artwork Stenciled By You!